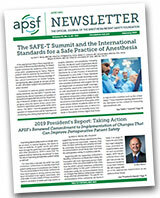 APSF has produced an 18-minute long video, Medication Safety in the Operating Room: Time for a New Paradigm, which was released in January 2012. The intended audience is everyone who works in the OR during surgery. APSF agrees that certain basic features (distinctive drug labels, color coding) are inherent in safe selection and administration of drugs in the operating room. Nevertheless, medication errors continue to occur and it seems unrealistic to keep applying these same principles in hopes that a different result will occur. Therefore, rather than reemphasizing these basic features APSF is advocating a new paradigm that we believe could lead to predictable and prompt improvements in medication safety in the operating room. This new paradigm, if adopted, would likely incorporate some or all of the following features (STPC).